Status: offline 22 year old male was hit directly in the hand with the ball on a hard pass. Immediate pain over the 5th digit. TTP along metacarpals of the 4th and 5th digits. What are the findings? Status: offline Any one see the movie Major Payne?? Status: offline Ouch... I just want to pull his finger. Wasn't it you that attempted to relocate a fibula?... I wouldn't hesitate in a hearbeat to attempt to relocate the pinky for this guy. LOL Wouldn't a little distraction with a little dorsal force solve the problem? Status: offline If you are going to reduce it, you should always distract, then magnify the deformity, then reduce. i.e. distract, palmar glide, then extend to reduce. they need to be splinted afterward. Status: offline Agree with Tom. Followup exam in a week or so to check for central slip injury/boutoniere (sp?) deformity. When you see this, you know the volar plate is almost certainly torn, and I'm not sure if the hand surgeons want to see those sooner or later. With torn volar plate, it will tend to redislocate upon attempts to extend thereafter. Status: offline Wow! Palmerly dislocated 5th PIP joint. Has it been relocated? Status: offline [QUOTE]Any one see the movie Major Payne?? [/QUOTE]great reference mike. Status: offline I saw the movie years ago but I forgot what happened. I assume someone dislocated their finger playing basketball? Status: offline These are always nice and easy to relocate (for those that are right handed, hold their hand with your left hand, distract at the base with your right hand and presto-chango). If it is an isolated dislocation, I don't get an xray initially, I try to save time and money. Post reduction gets a film. Splint in a simple aluminum splint on that digit until evaluated by the surgeon. How can we tell it's an "isolated dislocation" without fracture unless we get the films? I've seen people relocate these on the field, so I'm guessing the incidence of fracture must be extremely low? Status: offline Fracture or no fracture, it still gets relocated...by "isolated" I meant "isolated trauma" (ie not a victim of multi trauma injury/systemic trauma). So if a guy falls down at a game, and the result is a finger like this, isolated injury, simply relocate. If the relocation is difficult, a film is necessary. Post-relocation films are necessary for medico-legal reasons. Status: offline The post films I knew, but had a question about the pre-relocation films. Thanks Wags. 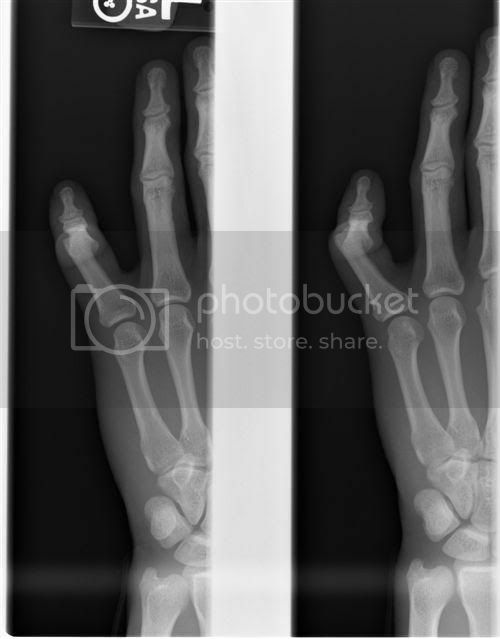 Status: offline Fracture or no fracture the finger gets relocated, the fracture can be identified on post reduction films. This saves pain, time, and money for simple dislocations (90% of the time you look at the finger and say "yep its dislocated" then look at the film and say "yep its dislocated" all the while 60 minutes has gone bye and the patient really really hurts). An experienced clinician can usually tell if there is a clean dislocation of a digit. Regardless, the disposition is the same...relocate,splint, referral. Status: offline How soon should it see a surgeon? Status: offline I tell the patient to call the next day. Status: offline Is it dislocation? Can it relocate it immediately? Hi all long time no see, come back again? Status: offline Yes that is a dislocation, easy to relocate and exceedingly common. Everyone was correct above. There is no fracture and indeed a dislocation of the PIP. After splinting for 6 weeks the patient came out of the splint and immediately redislocated and it appears to be unstable. He was sent to our ortho surgeon and will undergo surgical repair. Good job Lin, welcome back. Status: offline Lets start off the new year with even more!